We spotted this particularly photogenic first-generation Subaru Brat on our short trip through the American southwest a couple of weeks ago. 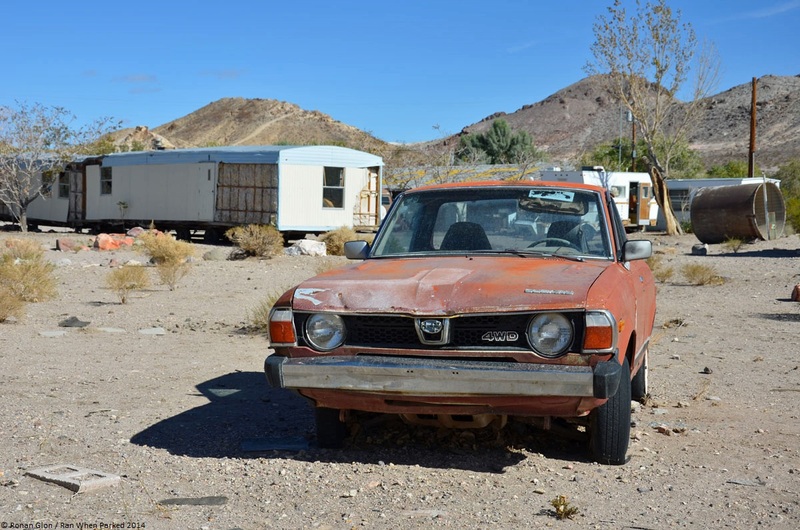 Famously classified as a passenger car by the EPA to circumvent the Chicken Tax, the Brat was a bit of an odd-ball in the United States in the 1970s, dwarfed even by small pickups built by Datsun, Toyota, Ford and Chevrolet. This impression has been amplified over time and the Brat looked positively tiny next to the lifted late-model heavy duty trucks that were driving by on a nearby road while we took photos. A faded logo painted on the Brat’s passenger-side door indicates its original owner was a small construction company based not far from the California / Nevada border. The car likely went through the hands of at least one other owner because we found it a couple of hundred miles away from the company’s headquarters. There are no inspections / insurance stickers anywhere on the Brat and the license plates are gone so it’s hard to tell how long it’s been baking in the sun. The body is pretty banged up and there are quite a few rust spots (which indicates it hasn’t spent all of its life in the desert) but it’s still salvageable, we’d bet that someone would even be willing to get it running, clean up the interior and drive it as-is. Previous post ← Is the Subaru SVX a future classic?